In preparation for Caitlin Doughty's second book I thought I would re-read her first. This member of the Order of the Good Death is a YouTube favourite of mine. I regularly enjoy her Morbid Minutes and Ask A Mortician series. Doughty writes very much like she speaks, making this an enjoyable read. I recommend watching a few of her episodes of Ask A Mortician before you take out this book so that you can get her voice and tone in your mind before you read. 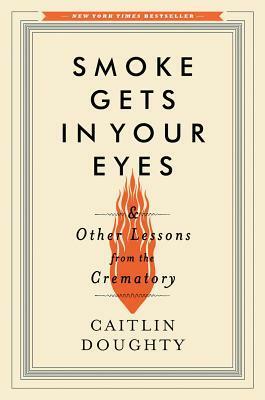 In Smoke Gets in Your Eyes Doughty takes the reader through the beginning of her carrier as a Mortician. From her start at a crematory through her schooling to become a mortician. Readers learn many of the hidden aspects of the funeral industry; from the corporations behind many funeral homes to how the laws and regulations vary from state to state, traditional burial and natural burial, embalming and cremation and so many other topics that some readers may find hard to face. Doughty has written a clear and educated view of this sometimes taboo subject and she has placed her signature lightheartedness onto every page. Doughty's use of humour and her complete lack of fear on the subject of death helped me understand sides of death that I didn't even know existed. She breaks down the walls and tells it like it is. One of my favourite chapters is right at the beginning when she gets her first job at the crematory. Doughty describes in detail the process and actually helped to put me at ease. I was one of those people that thought a crematory just threw a bunch of bodies in a big oven and gave the family a bag of random ashes, now I know better, thank you Caitlin! 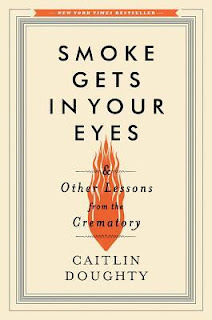 Whether you are a Deathling or just curious about the funeral industry or maybe you just want to prepare for your own death this book as well as Caitlin Doughty's web series are helpful tools to be enjoyed and learned from.